Bacteria are creative chemists, constantly discovering new ways to build unusual molecules for exploiting natural resources and fighting competitors. Many of these molecules look like short proteins, but they are not built the same way as traditional proteins. Instead of using the information in DNA, they are built using a dedicated assembly line of enzymes, each adding one piece at a time until each molecule is finished. Many familiar antibiotics are made this way, such as vancomycin and bleomycin. One of the great advantages of the approach is that all sorts of exotic molecules may be made, instead of being limited to the 20 natural amino acids. For instance, amino acids with the opposite chirality may be used, or amino acids with entirely different sidechains. This diversity allows the bacterium to create molecules with highly specialized functions and resistance to the natural defenses of other cells. The disadvantage, of course, is that the cell has to invest a lot of resources into the process, building dozens of dedicated enzymes to perform the many synthetic steps. These molecular assembly lines are typically modular, with each module composed of three types of proteins. One is an enzyme that finds the building block and activates it, typically by attaching it to ATP. Another enzyme performs the synthetic reaction, attaching the building block to the growing peptide. The third protein in each module is a carrier protein that holds the peptide during the process. 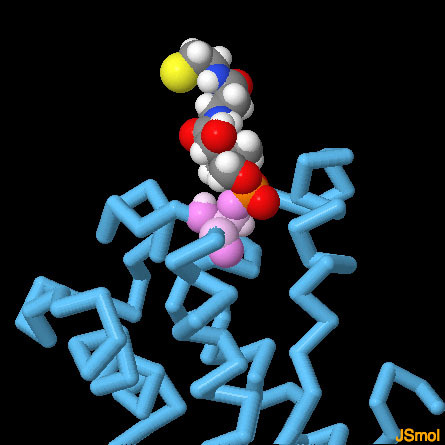 The carrier protein shown here, recently determined in a collaboration of PSI researchers at MCSG and NatPro (PDB entry 4neo), is involved in the synthesis of bleomycin, a powerful antibiotic that breaks DNA into pieces. 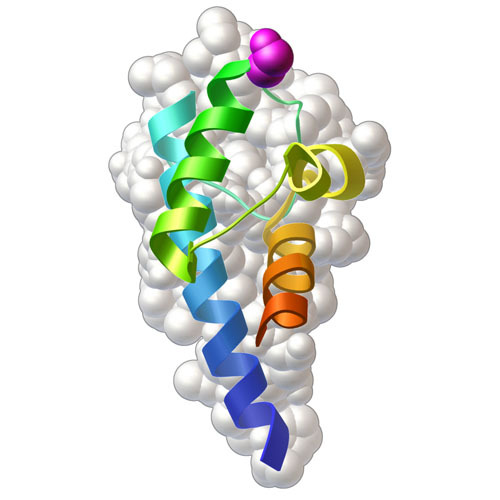 This small carrier protein has a serine amino acid at one end, shown here in magenta, that acts as the handle for holding bleomycin (attached through a special prosthetic group) as it is built. Bacteria take two different approaches to constructing these modular assembly lines. In type I systems, many of the enzymes and carriers are connected into one long protein chain, and the growing molecule is handed from module to module. The structure shown here (PDB entry 2vsq) shows the final module for the construction of surfactin A. 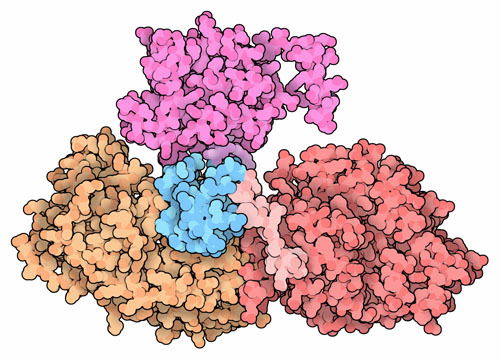 The structure includes the carrier (blue), the activating enzyme (red), the synthetic enzyme (orange), and one more enzyme that terminates the process (magenta). Type II systems, on the other hand, take a more familiar approach to biosynthesis, with separate enzymes and carriers that all work together during the process of construction. The BlmI structure shown above is the first structure of a type II peptide carrier. The trick to these carrier proteins is to hold the growing peptide in an activated and accessible state, so that it can be easily transferred to the enzymes in the next synthetic step. To do this, they use a long prosthetic group, called phosphopantetheine. It is connected to a serine on the carrier, and has a long flexible chain with a sulfur atom (yellow) at the end. The building blocks are attached there through an unstable bond, making them easy to transfer. PSI researchers at NESG have determined the structures of several carrier proteins from different biosynthetic systems, each with phosphopantetheine attached (PDB entries 2lki, 2ll8 and 2lml). To explore three of these structures in more detail, the JSmol tab below displays an interactive JSmol. Three structures of acyl carrier proteins are overlapped here. Each includes the phosphopantetheine cofactor (colored by atom type) attached to a serine amino acid (magenta) in the chain. Use the buttons to view the three structures, and notice how flexible the phosphopantetheine chain is. Lohman, J. R., et al. The crystal structure of BlmI as a model for nonribosomal peptide synthetase peptidyl carrier proteins. Proteins 82, 1210-1218 (2014). Condurso, H. L. & Bruner, S. D. Structure and noncanonical chemistry of nonribosomal peptide biosynthetic machinery. Nat. Prod. Rep. 29, 1099-1110 (2012). Ramelot, T. A., et al. Structure of a specialized acyl carrier protein essential for lipid A biosynthesis with very long-chain fatty acis in open and closed forms. Biochem. 51, 7239-7249 (2012). Tanovic, A., Samel, S. A., Essen, L. O. & Marahiel, M. A. Crystal structure of the termination module of a nonribosomal peptide synthetase. Science 321, 659-663 (2008). Ramelot, T. A. et al. Solution structure of 4'-phosphopantetheine - GmACP3 from Geobacter metallireducens: a specialized acyl carrier protein with atypical structural features and a putative role in lipopolysaccharide biosynthesis. Biochem. 50, 1442-1453 (2011). Srisailam, S, Lukin, J., Yee, A., Semesi, A. & Arrowsmith, C. Solution structure of acyl carrier protein from Nitrosomonas europaea. Proteins 64, 800-8003 (2006).